Autumnal. Don't you just love that word? Say it out loud. It just sounds so poetic and literary. It conjures up images of walking outside on a dark chilly evening in a warm cozy sweater, stepping on wet leaves. Look up and you see a large tree with orange and yellow leaves. The wet leaves shimmer in the moonlight. I love fall. I know many of you love summer but I usually start wishing for fall in June. It's still pretty warm here in Denver and I hadn't really started thinking about fall decor too much but then I got a catalog in the mail. I had never heard of The Company Store but we're still receiving mail from the previous owners and the catalog arrived. I fell in love with the cover photo. 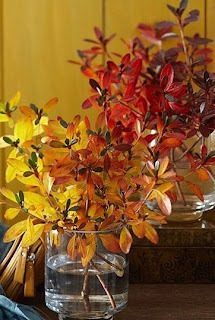 I love the colored glass bottles and how they complement the colors of the leaves. 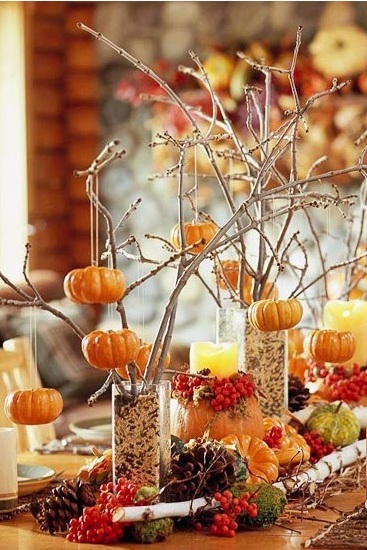 It got me in the fall decorating spirit so I went searching for more inspirations. 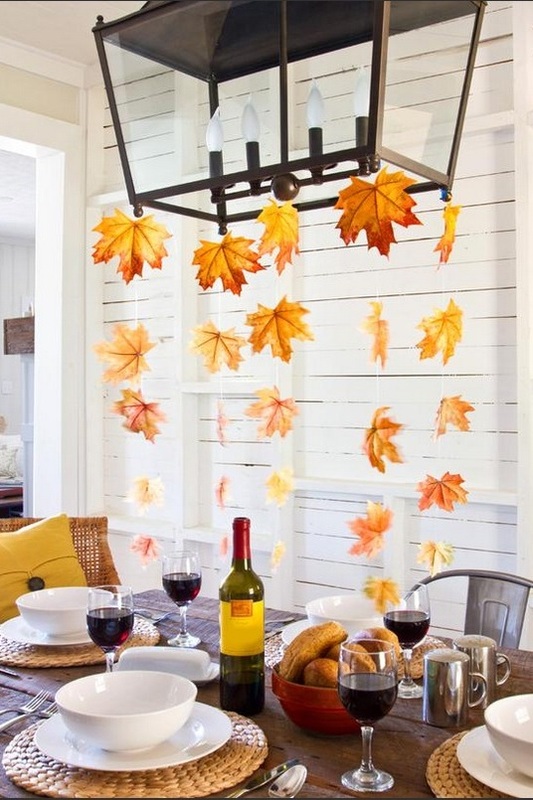 Here are beautiful fall decor ideas that I want to share with you. Fire, one of my favorite elements of fall. 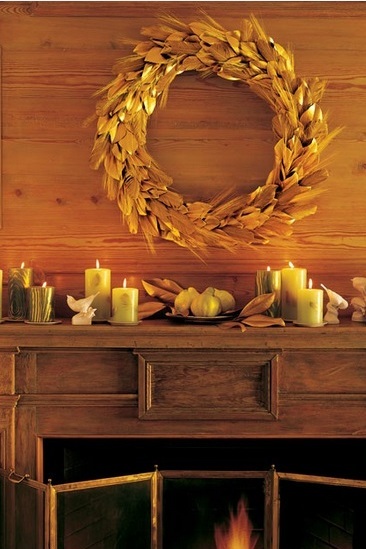 Whether it's in a fireplace or burning candles, fall is not complete without fire. 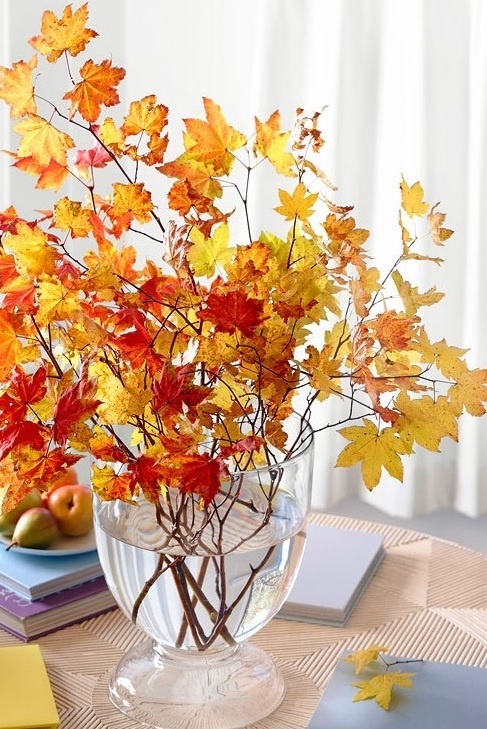 Leaves in shades of yellow and orange look beautiful in glass vases. 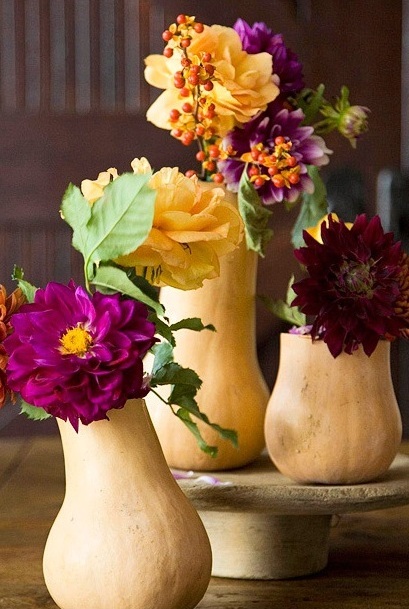 Pretty centerpieces for hosting intimate dinners with close friends. Can you hear the laughter and clinking wine glasses while classical music or jazz plays in the background? I can't wait to bask in the warmth and coziness of my favorite season. I'm sure you and your home will, with these beautiful inspirations! Love your inspiration photos. I am not yet feeling fall vibes but I am keeping my eye out for autumn decor. It is such a wonderful time of year. I love your writing and photos. I'm passionate too about travels, I've traveled all over Europe , never been outside it! So, it would be interesting for me to share your experiences and the influences in your home. So enriching! I like those autumn days where there is a low sun in a clear blue sky, and it illuminates all of the beautiful colours. Walking in the woods, as I do most days, is a real treat when the leaves are turning. Hi Khammany, nice fall photos. I'm drawn to the blazing colours of autumn, soft light and moderate temperature. Down under we are only approaching spring. Wonderful photos! I wish the weather would cool a little. 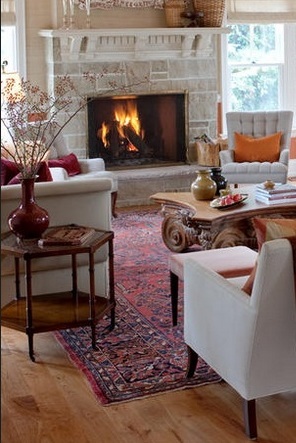 I love when there is a crispness to the air, and you can smell the fragrance coming from someone's fireplace! Ahhh!!!!! Wonderful inspiration pictures. Because fall is also the back to school season for me, I usually have no time to decorate, but I make sure to bring pretty leaves back home! ah! 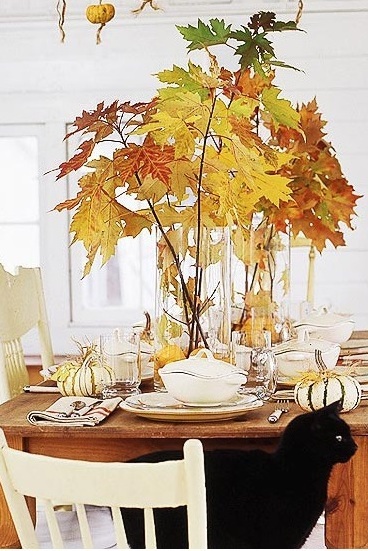 you are making me want to decorate for fall RIGHT NOW. so many fabulous ideas! Hi Khammany, great pictures as always! I absolutely love Autumn! Hands down my favorite season. You have many great photos to inspire us in our decorating. So happy to be following along now. I love the colors of Autumn. It's the best for decorating. I started doing a little today. You've inspired me to do more! Sweet hugs! Oooh this just makes me want to curl up with some cider and read a good book! 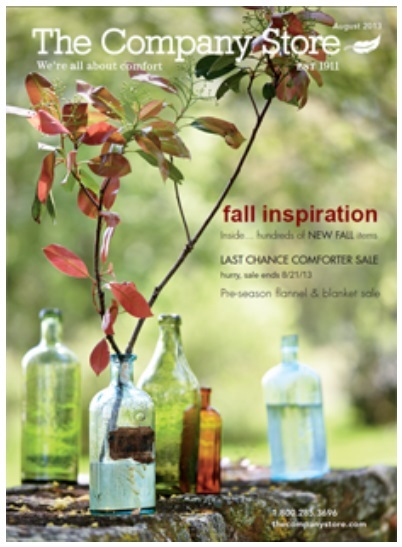 The Fall is one of the things I will miss most about Boston--but maybe I can borrow some of these great ideas to create Fall inside this year! ;) Thanks! Great pictures! Autumn is truly the best time of year! Oh, I so welcome Fall into my heart and home too! Lovely and inspirational photos!